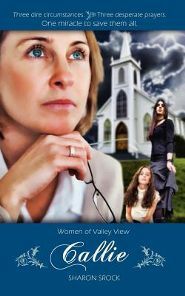 Callie by Sharon Srock is the first book in the Women of Valley View Series. I absolutely love the way Ms. Srock makes the characters in these books come to life. This is the third of her books that I have read and I was not disappointed at all. Callie has a heart of gold and a desire to help people, but she put her heart on the line and got it broken so deeply that she cannot face being vulnerable again. The problem is, Callie also loves the Lord more than anything. When she feels prompted to help a little girl in her Sunday school class, she has trouble explaining to God why she can’t get involved. Iris and Sam have a secret that is so precious it must be guarded with extreme care. In a world where everything good is only temporary, they have learned to survive and trust no one. But keeping their secret is also wearing them both out and the constant struggles are exhausting. Sam has done all she had to do to survive. She’s been wounded one too many times and knows just how dangerous it can be to get involved with people who can destroy your life. She has a goal in mind and she’s determined to reach it. When the one person she never expected to return appears in her life, Sam pushes back with all her strength. She must decide if she believes in the forgiveness of Jesus. Iris has never really had the luxury of being a kid but she’s safe with Sam and that’s all that matters. Every once in a while, Iris would like to be a kid and not have to keep her life so secretive. She knows what it means to be responsible and to take care of family. The weight of the world is heavy on her shoulders though and when she faces a situation she doesn’t know how to deal with Iris must learn to trust. In one of my favorite quotes in the book, Callie is talking about God to Sam. She says, “You know, there’s a song we sing at church about God being holy. Well, I’ve found that He is also w-h-o-l-l-y. He’s wholly everything I need in my life. Will you accept my invitation to church tomorrow? Give yourself a chance to hear about God’s love firsthand?” (pg. 186, pdf version). Ms. Srock does such a phenomenal job of weaving the story of Callie, Iris and Sam. This book is heart wrenching and there was more than one time that tears came to my eyes. I didn’t want the book to end! With wonderful storytelling ability, Ms. Srock shows what Christian love looks like in real life situations. Callie is a must read! I received this book from the author in exchange for my review.